I see I’ve put 111 hours into Skyrim, and yet I feel like I’ve barely given it a fair chance. I played it when it came out, but then got caught deeply by Arkham City. A couple months ago I decided to go back to it. Just going from point A to point B, I ran into three dragons. They’re not that hard to beat, but come on, that’s excessive for what are basically random monster encounters. 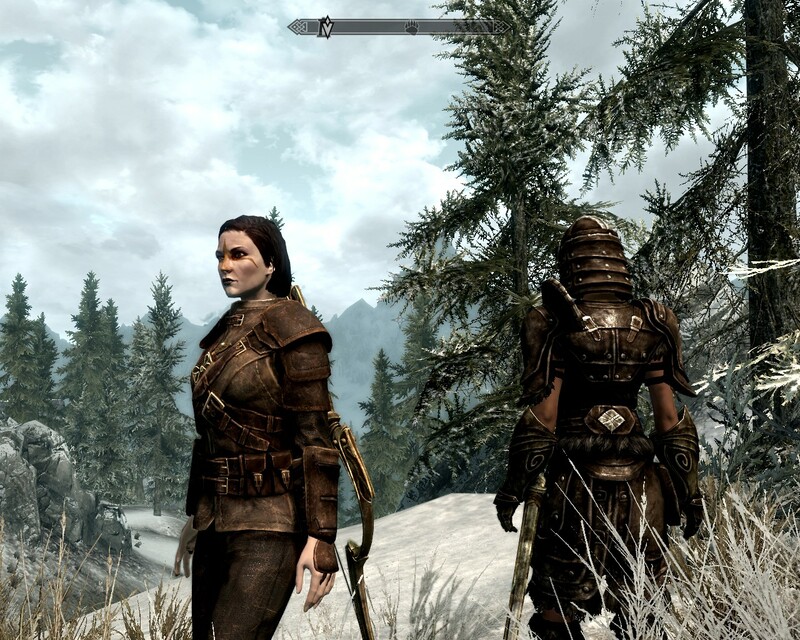 So I started a new character– Bethesda games are always the most fun on the first 10-15 levels anyway. I decided to be a beautiful but deadly rogue. Well, she turned out more horribly scary. But that’s not so bad in a thief. Anyway, I was having a good time, and then Saints Row III came by and sucked up another couple of months. Anyway, I got back to Skyrim this week and ran into a (beautifully textured) brick wall. You see, thieves are expected to pickpocket, and I’ve been given a task to pickpocket some bauble from a priestess in Solitude. And… I can’t do it, she always notices immediately. Turns out I have a skill of 17 in Pickpocket– oops. I put my next level perk into Pickpocket, which should give me a 20% success boost, plus I took a potion which should give 40% more. No go. I’m pretty sure I can swap the mission out, but not being able to pickpocket puts a damper on the whole questline. This is just no fun. Right now I feel that Skyrim is about the most brilliantly executed Epic Fantasy Generator ever– gorgeous, open-ended, deep, gritty– it improves almost everything about Oblivion— and yet it misfires somehow. Now, in part this is probably just RPG fatigue. I played a shitload of Oblivion. I loved Fallout 3; I loved New Vegas much less. If I’d never played any of these, I think I’d be blown away by Skyrim and be playing it for months. Plus, as I said, no one does “first ten levels” better than Bethesda. It can be frustrating being a low-level nobody. But that’s also what makes it compelling. You discover this wide new world, and you’re fragile as a mudcrab, and every bit of loot you find is precious. But I think there are a couple of actual problems. A somewhat plodding setting. Compare it to the post-nuclear wasteland of Fallout 3, the wuxia fantasyland of Jade Empire, the urban vampires of VTM Bloodlines. Skyrim is an absolutely stunning realization of a typical medieval fantasy. Repetitive quests. The only questline I’ve entirely completed is the magicians’ college, but the main quest and the thieves’ guild are not spectacularly different. Typically the next stage of the plot is to fight your way into a cavern and grab the McGuffin. If you want to take a break from the questline, of course, you can go out, find a cavern, and fight your way into it. A lack of compelling characters. This is to be expected in a world this open. But I’m not sure I’ve met any unusual or memorable characters. It might not be fair to compare to Bioware, which specializes in that, especially as the price seems to be a much more linear plot. But Bethesda has done better before! Fallout 3 had some pretty interesting people– Three Dog the radio guy, the blood-drinking emo clan, Dr. Braun. Oblivion did really well with the Brotherhood questline and the Shivering Isles expansion. Did they fire the people who did those bits, or what?